Is the slider for this discontinued model still available? And in the case of availibility: What does it cost? And in the case of non-availibility: How can that be fixed? Up till now all my tries to fix loose knobs on a slider by soft-soldering failed. (And all these were only loose and not broken like this one.) Not any of the solder alloys or flux I had by hand did work on this combination of alloy to mate (spring steel + chrome steel). And hard-soldering I did not dare, for I fear warpage of the slider for the heat (1300 - 1700 °C, depending on what solder is needed), so that the slider would not move properly afterwards. I always had to mate it with small wedges cut from matches. But this will not work on this, because it is broken. I hope there is still help. I would miss the slider on this fine harmonica. It is one of my favourite ones. 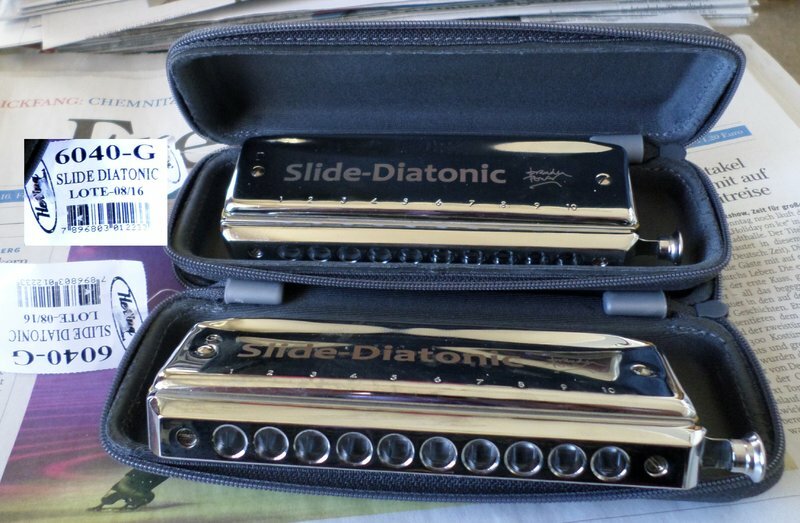 If Brendan doesn’t have any you might be able to fit a Hohner 260 slide on it. Thanx. Looks quite similar, and is still available. 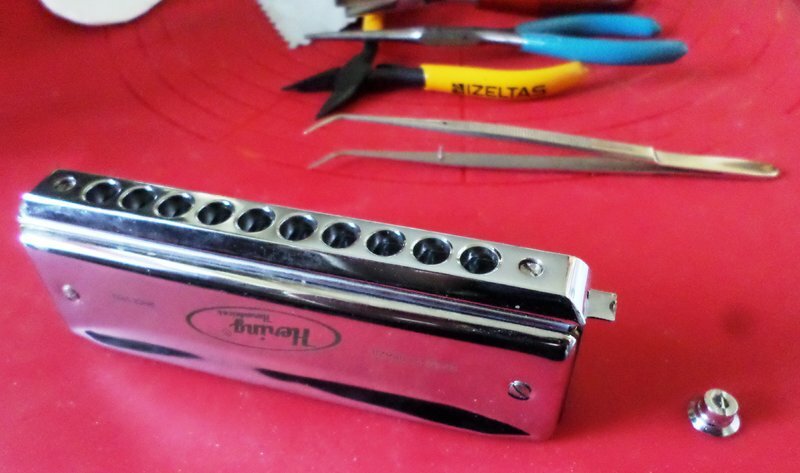 But most probably it needs some tweaking to fit it to the harmonica. And this material is really "tweak-resistant". Does anyone here know, whether the Hering 5140 is identical with the Slide Diatonic concerning basic construction, form and dimensions? For this one there would be available a complete slide unit in Berlin at least. Just more expensive than the slide only, but better than nothing. When will Brendan be back again? Or is here anyone else who is knowing and can tell, if standard chrom Hering 5140 has the same construction and dimensions as Brendan's Slide Diatonic Hering 6040? Is the slider still damadged. My neigbour has a WIG -weldig Equipment and he (for shure) can fix that. Zugriff auf WIG hätte ich hier selber. Ich bezweifle, daß das sinnvoll ist. Bei der hohen Temperatur wird sich der Schieber mit hoher Wahrscheinlichkeit verziehen und nie mehr richtig laufen. Ich hab schon von Versuchen mit Hartlöten abgesehen aus diesem Grund. Und außerdem ist der Schieber so abgebrochen, daß auch der kleinste Schweißpunkt an dieser Stelle nachher die Funktion des Schiebers beeinträchtigen würde. Der verfügbare Platz zwischen Schieberknopf und Mundstück ist zu eng. Die Fügung müßte präzise auf Stoß sein auf einer Fläche von weniger als 0,5 mm², obendrein Bimetall mehr oder weniger unbekannter Legierungen. Schon alleine die Möglichkeiten zum Spannen der Fügeteile sind ziemlich eingeschränkt. (Bereits schon anderweitig ausprobiert.) Und wenn mann anschließend den Schweißpunkt beschleifen würde, würde er wahrscheinlich nicht mehr halten. Ich hoffe, daß ich das Ding wieder instand gesetzt habe, bis ich nach Dollnstein fahre. 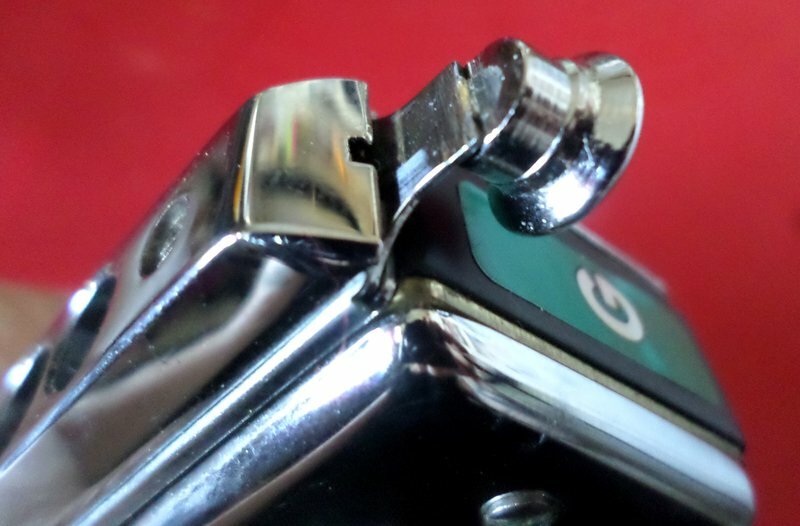 Is there anyone here who knows, what there are the highest temperatures recommended to treat a harmonica slide? Is it possible to fix a slide to its knob by hard soldering or TIG welding (tungsten inert gas welding) without the risk of severe warpage? Sometimes I have to fix some loose knobs (without rupture of the slide itself). Up till now I failed to find an appropriate solder and flux do soft solder it. And wooden wedges are not very durable. etwas akkurat zusammenzuschweißen. Auch kleinste Teile. jeweilige Legierung. Mansagt den Türken ein sehr gutes Gefühl fürs Material nach. Ich kann das bei ihm bestätigen. Hab auch schon Gitarrenteile schweißen lassen. Very sorry for my slow reply to this Triona, but it's good news: the two harps have exactly the same construction. So parts will swap perfectly between them. I have found that a tiny piece of an elastic rubber band can snug up the most problematic task of bonding two hard-to-bond pieces. I maintain a street piano in the town I live in and one of the repairs I did this early summer was to snug up a hammer shaft in the hole it seats in so that it wouldn't migrate left or right when played and not cause a bad sound. I didn't want to glue the shaft into the hole as so many people use the piano and the glue would surely not set the shaft properly in the receiving hole. SO, being a Yankee [sorry, GO RED SOX !!!] I used Yankee ingenuity. I just broke a small elastic into one length, poked one end into the receiving hole and then pushed the hammershaft down into the hole. It stayed and I was able to twist the shaft to the exact, proper position so that the shaft would stay in place when played, even if hit hard, which I don't do. I used the same idea just this past weekend when my guitarist friend complained that the "Whammy Bar" on his guitar would fall out because it wasn't snug enough. Again, elastic to the rescue. This was a particularly good use of the elastic fix as my friend also needed to be able to safely remove the whammy bar so that he could put his ax back in its case. I expect it would work with a slider button reattachment. I don't have one that needs that repair but I know the approximate depth of the inside of the button and I think you could fix the problem with the elastic. Seems like a no-brainer. Try it if you still need to, get some really thin elastic to experiment. I hope this helps you and anybody else looking for the cure. Remember, the answer is always know when you try, especially in dating, business and harmonica. No need to do all that, just use a Hering 5140 slide. And as CrawfordE noted, you could try a slide from one if the Hohner or Koch 10 hole chroms. In fact, just swap in their entire mouthpiece/slider assembly.